Each year these marvellous charities bring children who live in the most contaminated area near the Chernobyl reactor over to the UK. In summer, when the dust causes radiation levels to rise, it becomes even more important for as many children as possible to leave their contaminated homeland for a few weeks of fresh air and clean food. The rates of childhood cancer are incredibly high the most common cancers being thyroid and leukaemia. Coming to the UK for a four week break increases their immunity against the awful disease when they return home. Often these children are in remission. Sadly though there is a high chance of these children falling ill again. They all suffer living in such difficult conditions and with very little. Last year 36 children, teens and their interpreters went home with a beautiful Woolly Hug. This year we are keen to help even more groups, so Liverpool, Gloucester/Leeds (same Leeds group but this year spending 2 weeks at each location) Portsmouth and Helpston, Peterborough. .
That is about 70+ blankets!! Please do join us, here’s how..
* We would like 12″ squares in bright and cheery Stylecraft Special DK colours. * PLEASE AVOID USING black, bright green, bright pink, browns, greys, citron, sunshine, fiesta, jaffa and any pale pastels, white or cream for practical reasons. This will help squares fit together more easily. * Make squares in a neutral colour theme, or more specifically for a boy or girl. As much as we don’t like to think of colour as being gender specific, these children may. * We will be happy to accept 6″ squares if making a 12″ one feels too much. * Crochet or knitted, 4mm hook or needles. Single colour, mixed colour, simple, complex. No blocking and please sew in pesky ends. * If needed, we can supply yarn. Let us know if we can send to you. * Posting of squares please to the South Coast address, PM if you need it. 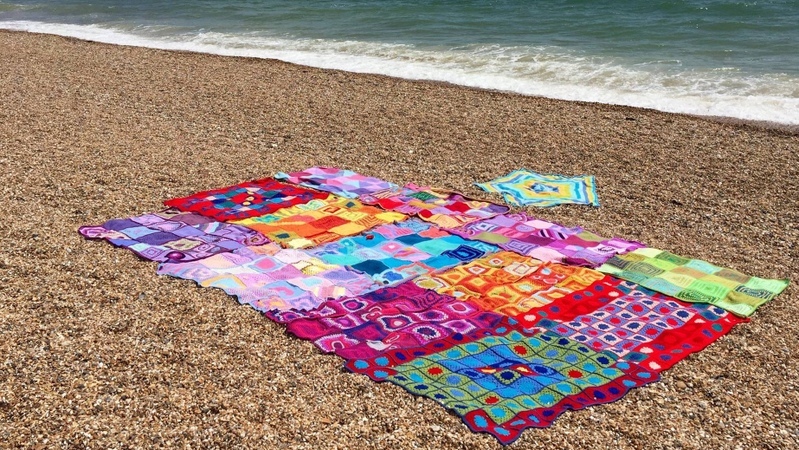 If you think you’d like to make a whole blanket that is WONDERFUL, but please contact us first.We will be asking for gender neutral blankets which are 48 inches by 60m, but would just like to chat to you first, thank you! Can anyone help with extras? There are a few extras which we will be collecting too alongside squares, items which really help, if you would like to add in any of these we would love to receive them for the children, thank you, bless you. * Toiletries, toothpaste, shower gel, shampoo etc, but not bars of soap please. * Any little luxuries that teens might love, eg hair clips, make up bits, stickers etc. If you would like to add 50p in when you post squares for ice creams that would be so kind, we will split any money we receive between the groups. No later please as we have to get on and sort at the end of that following week. Thank you. The rush will be on as the first group, Portsmouth arrive in May. What a big ask! Good grief! But the fabulous Woolly Hug crew never fail to amaze, last year was an astonishing team effort, as the photo shows, we know that together we can do this. On behalf of these children and their families, a huge THANK YOU. Actually, thank you doesn’t really come close. * Photo is the collection from last year that went to the Portsmouth group. Angel Hugs for Bereaved families.